Early Booking Offer – Book your stay early and save up to 40% off. Please contact us for further details. Embark on a journey of a lifetime to one of the world’s most illustrious tropical island destinations in the iconic picture-postcard Maldives. 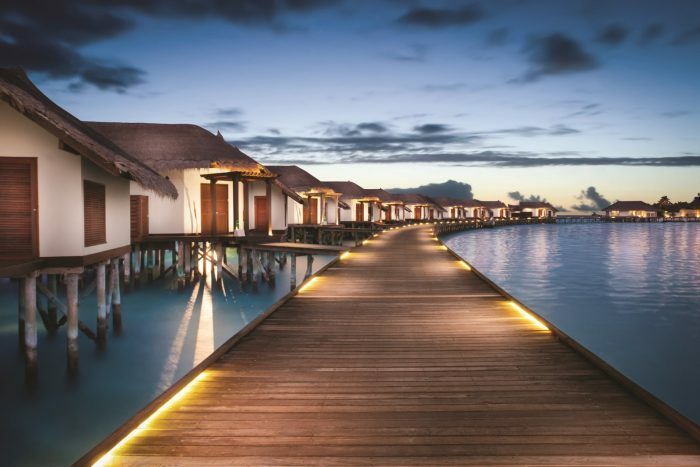 Well and truly push the boat out with a trip to Maldives Jumeirah Vittaveli and expect indulgence on a scale second to none. The resort has everything to complete your holiday and keep you talking about it months after you get back home, from a spa using 100% organic products, cooking lessons, modern gymnasium to manta ray feeding and invigorating water sports. Accommodations are unimposing on the dramatic island scenery and feature timber flooring, private swimming pool, deck and sala day beds. The Maldivian resort rests on a vast stretch of pristine beach framed by exquisite ocean and is blessed with all year round warm weather. With prestigious addresses in some of the world’s most sought-after destinations, Jumeirah excels in providing textbook luxury services and perfected hospitality. Early Booking Offer – Book your stay early and save up to 40% off. Honeymoon Package – Upgrade to the honeymoon package to be pampered and indulged. Let every inch of your body uncoil with a deeply relaxing massage at the Talise Spa, boasting signature couples massages for an intimate experience leaving you both refreshed and energised. Workout at the fully equipped air-conditioned gym. Explore underwater with 5 star PADI certified instructors. Or get up close to the coral reefs and their friendly inhabitants with a snorkelling expedition. Kayaking, sailing and sunset fishing are also available. Any first time visitors to the Maldives are guaranteed to be blown away by the sheer magnificence of the scenery. Perhaps never before have you witnesses such vivid saturations of colour than those that permeate the Maldivian landscape. From pure turquoise lagoons and flawless blue skies to pearly white sugar sands and zany flashes of colour found amid tropical flowers and rare wildlife. This secluded locale, where only a lucky few visit, is what ultimate honeymoon dreams are made of. Staying in such a luxurious abode in such exotic settings is sure to ignite passion and romance in newlywed couples. Honeymooners will appreciate the level of privacy and attention to detail in the semi-open rain showers, outdoor round bathtubs and four-poster beds facing the sea, all ideal for intimate moments to be cherished. Lovers may walk tirelessly on the soft shores of the private-island or converse over dinner and drinks in one of the various fine dining establishments. Words are not enough to exemplify this marvelous place, you have to see it to believe it and whenever better to make the imagined come true than on your honeymoon. There is something for everyone at the resort’s varied restaurants and bars. From gourmet European and Asian buffet breakfasts to cocktails, fresh juices and locally inspired tapas at sunset and plenty of delicious fare in between. Samsara – International cuisine plated up with a backdrop of the magnificent Indian Ocean. Mu – Succulent meat cuts and freshly caught fish and seafood grilled to order at this beachfront barbeque eatery. Fenesse – Classic dishes from Italy, Spain, Greece and the Mediterranean served in a unique overwater setting. Bar-ee – Soak in earth-shattering sunsets at the chock-full 360 degree bar.